Set behind a delightful Provencal façade lined with a charming rose and lavender border, Le Quartier Français welcomes visitors from all over the globe who come here to dine in fine style and spend the night in a room with a spectacular view. Set behind a delightful Provencal façade lined with a charming rose and lavender border, Le Quartier Français welcomes visitors from all over the globe who come here to dine in fine style and spend the night in a room with a spectacular view. Of course, some call it an Auberge, others an exclusive country inn. In any language, Le Quartier Français is a splash of style in the heart of the historic village of Franschhoek, a quaint corner of the Cape wine lands that is forever a little French. Le Quartier Francais - Food Recently voted as one of the top 50 restaurants in the world the food is a mélange of French, Malay and traditional South African dishes, Margot Janses’ menu tempts with a modern twist of the old Cape and the new. The cuisine is contemporary and creative, using seasonal local ingredients. Guests have a variety of dining options: At the Auberge there are The Tasting Room and iCi. 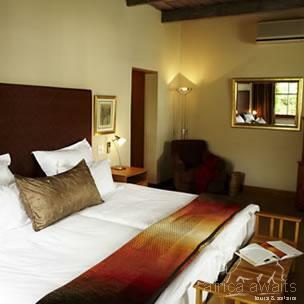 The suites and luxury rooms are stylishly furnished with refreshing colours, brilliant fabrics and modern fittings; air-conditioning and ceiling fans for hot summers with wood burning fireplaces for winter. Here, the old world meets the new in a marriage of sophistication and comfort. Guests of the property may indulge in our beauty treatments or choose from a bath menu designed to pamper and relax. 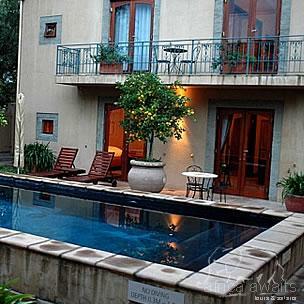 Discerning world travellers who stay in the loft and ground floor suites relax around the large swimming pool in the Victorian courtyard by day. Honeymoon couples retire to the intimacy of the exclusive set in a private garden courtyard with a natural Mediterranean pool. Four Quarters offers Le Quartier renowned service combined with the utmost in luxury and secluded comfort. Consisting of only 4 suites – 2 upstairs and 2 downstairs; surrounding a private swimming pool and a private bar-lounge area with a full time butler, this is an ideal spot for families or friends to reserve exclusively. The highly trained staff are dedicated to spoiling you. Elegance made simple is the art of living around here. The Screening room - An intimate cinematic theatre experience with the style and decadence of halcyon days gone by - enjoy celebrated classics to cinema nouveau, or the latest movies; from the comfort of one of twenty four arm chairs. Indulge in some couch time, drink in hand. With state of the art audio-visual equipment and great eats from iCi. 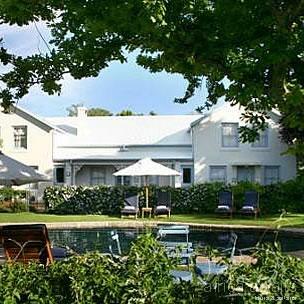 With your holiday, safari or business trip from in to Le Quartier Francais in Cape Winelands.